In 2014, the defeats by ISIS led to the fall of Nuri al-Maliki’s Iraqi Shia supremacist regime in August, and his replacement by the more moderate and inclusive Haider al-Abadi. But the Iraqi Army’s morale had been badly shaken, coalition trainers were simply inadequate to produce the quick turn-around western leaders had hoped for, and the Shia militia—backed by increasingly overt Iranian support including advisors, weapons, and Iranian airstrikes—began to outperform the Army. Hadi al-Ameri (the Iraqi transport minister but, more importantly, a key leader of the Popular Mobilisation forces) has become an extremely important player, as is former Prime Minister Maliki, who’s done everything he could to undermine his successor from his new perch as one of Iraq’s vice-presidents. Qasim Soleimani, head of the Quds Force (the external covert action service of the Iranian Revolutionary Guards) is now a visible presence both in Baghdad and Irbil, and on the front lines. Ironically, this turned out to be the high point for 2015 thus far. Despite occasional local successes, Iraqi forces (whether from the government or the militias) have generally failed to dislodge ISIS from its territorial gains. ISIS captured Ramadi, capital of Anbar, in late May, in a major setback for the government. This gave ISIS control of almost the entire length of the Euphrates. Over the summer ISIS mounted further offensives, and is now attacking the crucial hydro-electric dam and water supply at Haditha, the major oil refinery and town of Bayji, and several other key locations. Prime Minister Abadi forced through a series of political and governance reforms in early August, in the face of strong opposition from Maliki (who stood to lose his position) and the militias. Mass protests against corruption and government inefficiency also broke out across Iraq—even in the generally pro-government south of the country—and as of early September Abadi is heavily embattled on the Iraqi political scene, attempting to salvage some form of workable government structure. On the military side, any attempt to recapture Mosul has been shelved indefinitely, Iraqi forces attempting to recapture Ramadi have suffered a series of setbacks (including the killing of two generals by an ISIS suicide bomber, and several tactical reversals) and ISIS is busily turning the city into a fortified stronghold while attacking around its outskirts to keep Iraqi forces off-balance. The Islamic State’s motto is baqiya wa tatamaddad—’remaining and expanding.’ Right now, in Iraq as in Syria, it’s doing both: holding the terrain, population and economic assets it has seized, while expanding its control and threatening the survival of both Iraq and Syria. Despite rosy assessments of progress coming out of US Central Command and the White House, the hard reality is that what we’re doing on the ground simply isn’t working. The military fixes are relatively obvious, the political ones less so—and much more problematic. On the military side, we need to start targeting ISIS as the conventional, state-like entity it’s become, not as the terrorist or guerrilla group it once was. That means striking infrastructure, routes, headquarters and installations used by the organisation, applying battlefield air interdiction to cut off the ability of ISIS units to reinforce each other, and—most fundamentally—engaging in a substantial and rapid increase in the size and weight of airpower being used. It also means unleashing the trainers and advisors (who are currently constrained from accompanying their Iraqi partners into combat) deploying Joint Terminal Attack Controllers to improve the accuracy and speed of air targeting, enabling certain specialist units to engage in direct combat, and losing any residual thought that this is a war of occupation or a counterinsurgency campaign. It’s not—the enemy is a conventional force that’s fundamentally outmanoeuvring and outfighting the Iraqis, and needs to be dealt with as such. The political side is even more problematic. Without a functioning Iraqi state, there’s nothing to be gained by rolling ISIS back, especially when the vacuum is only likely to be filled by Iran, further deepening the existing region-wide Sunni-Shi’a cold war that’s already spilled over into Yemen. Similarly, the influx of weapons and trainers into Iraqi Kurdistan hasn’t only disrupted a delicate balance between the dominant PUK and KDP factions, but has also empowered pro-separatist elements allied with the PKK and put Turkey on edge. Following Turkey’s entry into the war several weeks ago, Turkish aircraft are now striking not only ISIS but also Kurdish positions inside Iraq and Syria. The risk is very real that the entire geopolitical fabric of the region may collapse. Where to, then, from here? Four current events—most of them outside of Iraq—are about to transform the conflict. Those are: Turkey’s entry into the war, Russian military intervention in Syria, the Iranian nuclear deal and the possibility it creates for increased US-Iranian cooperation in stabilising Iraq, and the European refugee crisis, which is finally beginning to prompt calls for action to deal with the problem at its source. To be honest, I’m not at all confident those developments will bring about any improvement on the ground, in a war we’re currently losing. What they may do is to bring about a political shift that enables a substantive rethink of current strategy. For all the tactical skill, selfless dedication and professionalism of the Australians, Americans and others already committed to the fight, the harsh reality is that without such a rethink, this effort is highly unlikely to succeed. David Kilcullen has worked for the US and Australian governments as an expert adviser on counterinsurgency. In 2007-08 he served in Iraq as a senior adviser to General David Petraeus, helping design the US-led coalition troop ‘Surge’. 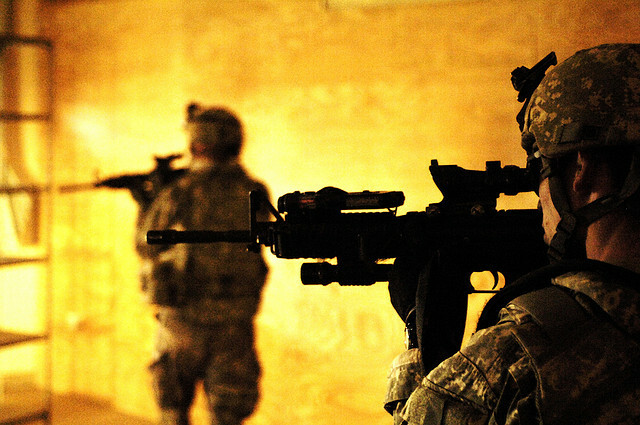 Image courtesy of Flickr user The U.S. Army.